A Scottish kilt buckle is not particularly difficult to find online these days, as most online stores will furnish you with all accessories necessary to complete your full Highland Dress outfit. However what if you don't want standard accessories? instead you want perhaps to customize yours with your family crest, or a specific Celtic design, well I'm glad to say that's not a problem. Anything individually hand crafted does of course cost substantially more than massed produced items, but you then have a quality accessory unique to you which if properly looked after will last you a life time. You may well decide that you need more than one belt buckle as the kilt is nowadays wore on many different occasions. 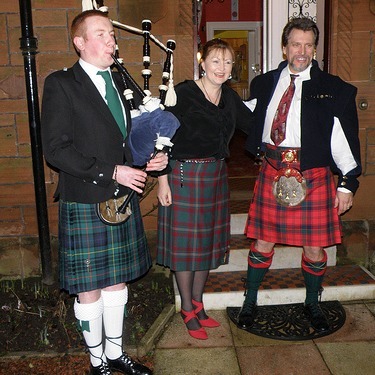 For casual wear for instance to dress down your kilt, you may decide on a simple one which you can normally find in any good Highland Dress supplier. Either on your local main street or online, the choice nowadays is plentiful. 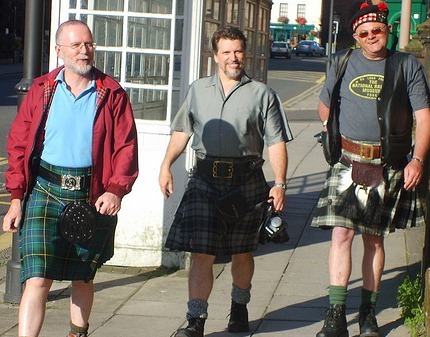 The photo below is a good example, in it you can see three very different kilt belt buckles being worn, all of them in a casual manner. For more formal occasions, this is where a highly decorative one comes into its own, and helps to show your outfit off to its full splendour. Below you can see a photo which shows a decorative belt buckle being worn. And if you look very closely you will notice the same man in both photos. There is however one situation where you would not wear this accessory as it would be hidden from view. And that is when you are wearing a Prince Charlie jacket and waistcoat (vest). This is evening wear at its finest, the highly decorative jacket and tailored waistcoat compliment your outfit as does no other accessory, and the belt and buckle should not be worn as it spoils the lay of the waistcoat. As this site continues to grow and develop I will be supplying links to high quality suppliers. However if you need any further info at this time please contact me using the "Contact Us" page and I will be happy to assist you further.